When we first revealed Pyre earlier this year, we got a great response to the game’s mystical purgatory setting, and its distinct blend of party-based RPG exploration and competitive action. We showed you a glimpse of the game’s ensemble cast, and the ancient competition called the Rites, in which exiles battle to regain their freedom. Through it all, one exciting question kept coming up again and again: is Pyre going to have multiplayer? Today we can confirm that the answer is a resounding yes. At PlayStation Experience this weekend, we’re proud to present our first-ever multiplayer offering in Pyre’s head-to-head Versus Mode. PlayStation Experience attendees will be able to challenge each other in one of the game’s fast-paced ritual showdowns. We love playing this game against one another at our studio, so we cannot wait to see what you think of it! Q: Wait, you’re making a multiplayer game?! A: Pyre is a party-based RPG that will have a two-player head-to-head Versus Mode in it, in addition to the single-player campaign. Think of the multiplayer as a bonus on top of the single-player. Our focus during development has first and foremost been the single-player campaign experience, and creating the interesting and memorable cast of characters you’ll get to know during your journey. Multiplayer was something we also thought had a lot of potential, but was something we were only going to pursue if we felt we could pull it off without compromising on our ambitions for the single-player. We had to get to this point in development to make sure of that. Q: What is the object of the game in Versus Mode? 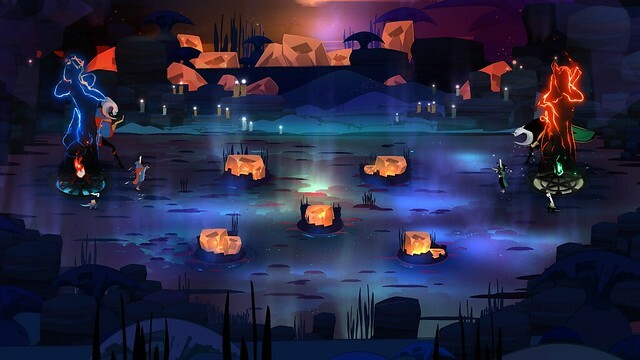 A: The ritual competitions in Pyre play out like a one-on-one competitive action game. The object is to extinguish your opponent’s ceremonial flame, by grasping an object called the Celestial Orb then diving into the flames with it, or simply throwing it in. You have at your disposal three different exiles, though just one is permitted to move at any given time (you can switch control between them instantly). You can slip past your opponents by sprinting or leaping over them. You also have a defensive aura that banishes your foes on contact, or can be cast like a projectile attack. Each of the different characters has his or her own unique attributes and special abilities. Which characters you bring into the field, along with the variety of unique environments, make it so no two Rites play out the same way. Q: Can you play online or is it only local multiplayer? A: Our Versus Mode pits you and your opponent against each other on the same PS4 in local head-to-head competition. This arcade-style experience is well suited to Pyre’s gameplay, and ever since Bastion we’ve wanted to make a game you could play with a friend in the same space. As for online play, we haven’t made a decision yet on whether online play makes sense given everything else we’re doing on Pyre with our small team. We think bad online multiplayer is worse for a game than no online multiplayer, and we promise to do what’s best for the game as a whole. Q: Will I be able to play Versus Mode single-player against the computer? A: Yes! We plan to support that. A: Great! Send them along with any impressions to @SupergiantGames or visit our web site for more details. We’d love to hear from you. And thanks for reading! We’re in the thick of development on Pyre and well on track toward our planned launch sometime in 2017. Oh man, was so looking forward to this game, but not having online multiplayer kills it for me. Was looking forward to the competitive side of this game against another human mind. Such a bummer to read this. What a kick to the nards. I sad. I loved Bastion on my PS Vita! I hope there are plans to also bring Transistor as well as Pyre to PS Vita in the future. 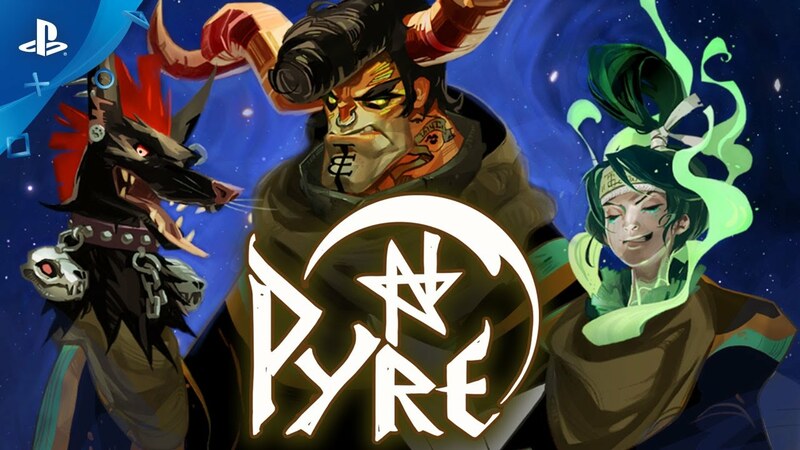 Pyre looks really cool. Ever since I first saw it I thought how cool it would be if when you encountered battles in the story if you were actually competing against other players that were on the same part of the story as you were. Understanding that was not going to be the case I was really hoping for a versus mode announcement and now that we have one I am glad you guys made that decision to support multiplayer. However I feel you should strongly consider online multiplayer as well, I know it may not be possible with your team, and maybe not at launch, I still say to you strongly consider.